Mariele Neudecker, For Now We See, 2014, installation view. Solo exhibition as past of the Euroscience Open Forum's range of events. 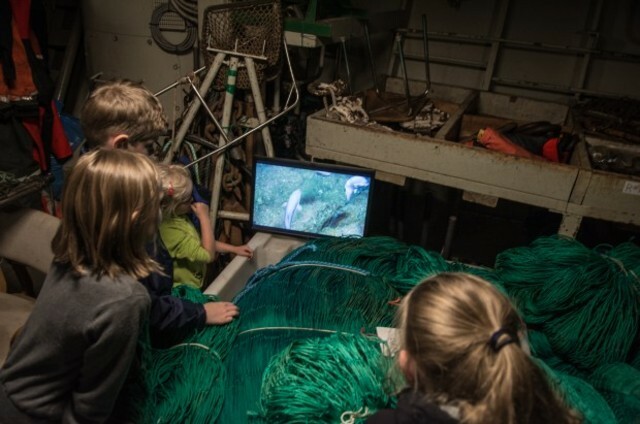 Mariele Neudecker’s video installations about the deep sea were located in unusual locations such as the living quarters on Dana, a Danish vessel used by scientists to investigate the effects of fishing on marine ecology and monitoring ocean conservation. For Now We See’ was created through Neudecker’s collaboration with Prof. Alex Rogers marine biologist Oxford University and founder of IPSO a campaign to support the oceans. The works were first shown in the basement of a Regency House at ‘HOUSE 2013′, Brighton Festival and then by Invisible Dust in St Thomas’ Church at the British Science Festival, Newcastle September 2013. ‘For Now We See’ is the result of 16 terabytes of video taken by cameras attached to a remotely operated vehicle (ROV) that travelled to a depth of 3000m from the RRS James Cook (a British Royal Research Ship) in an expedition led by Prof. Rogers to the bottom of the world’s deepest oceans. Neudecker meticulously edited the video with the addition of a musical score and other human sounds such as clocks ticking to illustrate that man’s influence has stretched into the world’s most isolated and fascinating marine environments. Neudecker’s addition of sound to the original silent video footage, (the scientists have no requirement to record sound) only heightens the sense of exploration and drama as the viewer experiences deep underwater space.